(Photo: © Marianne Ejdersten / WCC)World Council of Churches general secretary, Rev. 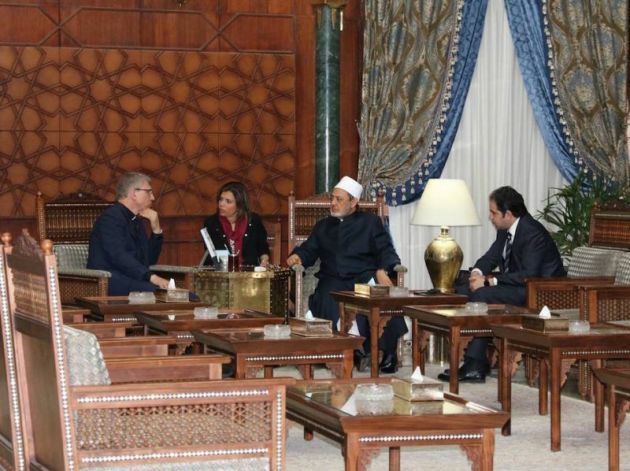 Olav Fykse Tveit and Dr. Ahmad Al-Tayyeb, the Grand Imam of Al-Azhar mosque in Cairo Egypt at an April 26, 2017 meeting in Cairo, Egypt. Pope Francis has arrived in the United Arab Emirates for the first ever visit by a pontiff to the Arabian Peninsula during a flurry of recent interfaith activity in Abu-Dhabi. His historic visit was preceded by a call from the general secretary of the World Council of Churches Rev. 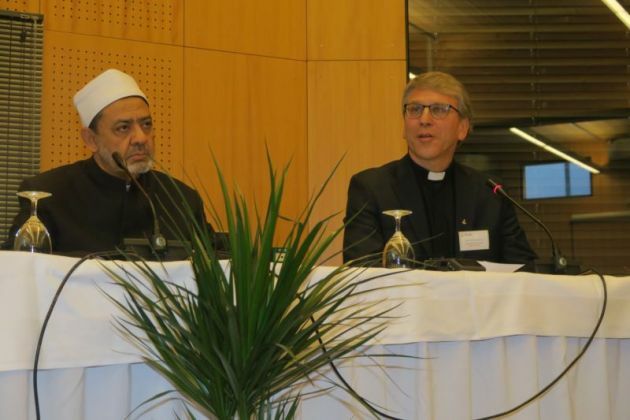 Olav Fykse Tveit at an international, interreligious conference in Abu-Dhabi, for the use of religious influence and institutions to nurture tolerance and respect. Tveit was speaking at a Feb.3-4 conference organized by the Muslim Council of Elders, the Global Conference on Human Fraternity. Among those attending are Pope Francis, the WCC, international religious, intellectual and media personalities from a variety of religious traditions and included, along with the Grand Imam of Al Azhar, Dr Ahmad Al-Tayyeb. Francis landed in Abu Dhabi on Sunday where he was greeted by Crown Prince Sheikh Mohammed bin Zayed al-Nahyan. The Pope will take part in the interfaith conference and on Feb. 5 will hold Mass in which 120,000 people are expected to attend. Before leaving he expressed concern about the war in Yemen, in which the UAE is engaged as part of the Saudi Arabia-led coalltion. "The population [in Yemen] is exhausted by the lengthy conflict and a great many children are suffering from hunger, but cannot access food depots," the Pope said, the BBC reported. "The cry of these children and their parents rises up to God," he said. With a population of just over eight million, the UAE is home to nearly a million Roman Catholics, most of them from the Philippines or India. Some have been queuing for passes for Tuesday's Mass, reported the BBC. One told AFP news agency the Pope's visit "opens doors for conversations about tolerance that the whole world needs to hear". In a video message before he left the Pope said: "Faith in God unites and does not divide, it draws us closer despite differences, it distances us from hostilities and aversion." He paid tribute to the UAE as "a land that is trying to be a model of coexistence, of human brotherhood, and a meeting place among diverse civilizations and cultures." While in Abu Dhabi, the Pope will also hold a meeting with Sheikh Ahmed al-Tayeb, the grand imam of Cairo's al-Azhar mosque, which is the highest seat of learning for Sunni Muslims. In his Sunday speech, the WCC's Tveit said that the evil influence of racism challenges all, from whatever faith. "Racism is a reality, degrading, discriminating and excluding others. Racism is a human sin and one of the most dangerous poisons in our lives as one human family," said the WCC leader. Linking one God and one humanity, he noted, the role of religious communities is to "inculcate the value and concept of citizenship on the basis of diversity, promotion of freedom of religion and belief, and solidarity among different religious communities." "Today a new communal narrative and a new social pact are needed for us, everywhere, also in the Middle East, the cradle of our three Abrahamic religions. (Photo: © Peter Kenny)Dr Ahmad al-Tayyeb, the Grand Imam of Cairo's Al-Azhar mosque and university and the General Secretary of the World Council of Churches Rev. Olav Fykse Tveit at the WCC's Ecumenical Institute in Bossey on Oct. 1, 2016. "Particularly the most vulnerable should experience the true support and solidarity of all. Among those who have been suffering the longest from lack of solid citizenship, lack of equal rights and proper protection, are the Palestinian people" said Tveit.